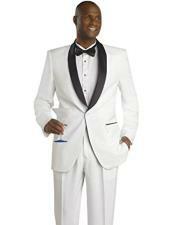 A white tuxedo is an appropriate choice for weddings and other black tie event. The occasion, location of the event, time of day, time of year and your role in the affair may all influence color decisions when purchasing a tuxedo. 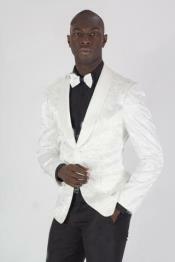 White tuxedos are appropriate for weddings, proms and other semi formal occasions. 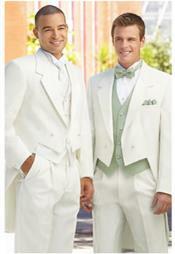 There are many options, styles and designs available in white tuxedos. The white tuxedo is a popular choice for morning and afternoon weddings. 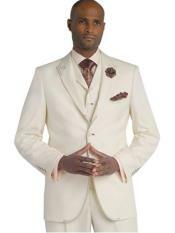 The groom may wear white or the entire wedding party. For outdoor weddings in the daytime, white is a great choice. 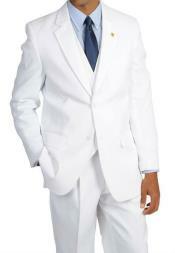 A lightweight white tuxedo may be more comfortable, particularly in the summer months. 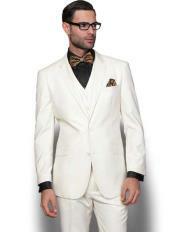 A white tuxedo works well with a broad range of color options in ties, cummerbunds and even shirts. A white shirt with a colored bow tie and cummerbund is a classic look. For weddings and proms, the tie and cummerbund is usually chosen to match the dresses of the wedding party or prom dates. In other cases, the choice of tie color is up to you. White shirts and cummerbunds look great with white tuxedos too. There are many design choices available when selecting a white tuxedo. Jackets are available with or without tails in single breasted and double breasted styles. Fashion tuxedos have features such as long coats and mandarin collars. A band shirt is a great choice with a mandarin collar, since a tie isn't required. In this case, a colored shirt is a great choice in either pale or bolder colors.